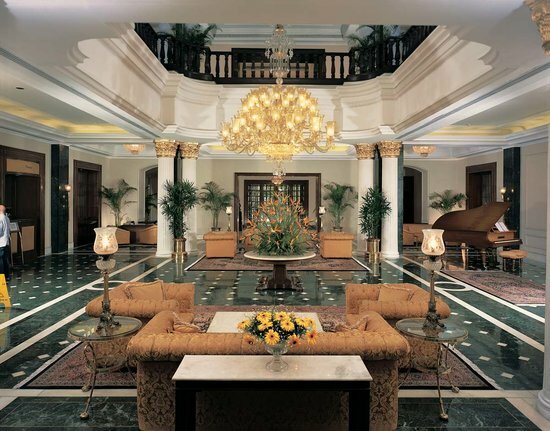 The great hotels of the world – the Raffles, the Grand, the Taj Mahal, and the Oriental – were all built in colonial times; and, like the English clubs throughout the Empire, were cultural safe havens, islands of civility amidst the heat and dust, squalor, and crowds of Asia. The British had a mission to govern, but no rule written or otherwise suggested that they live like the ruled. Not only would that be unpleasant but such familiarity would unnecessarily complicate their mission. There was simply no room for the messiness of love or anything more than casual friendship. Better gin pahits, polo, and cricket at the Tollygunge Club than anything more immediate and local. Of course there were many cracks in the armor. Forster who understood India far better than Kipling who wrote of boys and tigers and the romance of the subcontinent, understood that relationships between English and Indians would always complicate matters. Indian women were, after all, quite beautiful; and young men sent out to India for years at a time were far less interested in the pale lot of English women who followed them and much more in the fair beauties of Kashmir and Bengal. Yet there was more to British cultural distinctiveness than clubs, snooker, and grand hotels. There was an ethos – a code of behavior, purpose, and mission that prevailed; that kept men and women in line and within bounds; and that assured allegiance to something more than rule itself – the greatness and rightness of Empire. Graham Greene wrote of Empire in Africa, a far cry from the sumptuousness and elegance of the Raj; little more than outposts in the White Man’s Grave, an administrator, a few policemen, unhappy women, and an inevitable mix of cultures. In The Heart of the Matter Greene wrote of Scobie, a policeman caught in this dangerous mix, who compromises himself to the Syrians for the chance to do right by his wife and arrange passage for her to England, freeing himself to live with his lover. Scobie broke all the rules of culture, morality, and religion but could never be free from the guilt of such disregard. There was no good, easy, and safe way to become less English. Joseph Conrad wrote as compellingly about British expatriates who could never square the allure of the jungle and the desire to be free from England with its unknowability and primitivism. Kurtz, the Englishman who ran an interior outpost far up the Congo River thought he could manage both – the civilizing missionary he was set out to Africa to be; the primitive ruler of his own jungle tribe; and a Nietzschean man of universal, dark principles. His last words were ‘The horror…..The horror’, a final recognition that he was never the master either of others nor his own fate, that savagery was universal, and that no attempts to accommodate or tame it would every be successful. Conrad’s other expatriates are less driven and willful and are trapped by their Englishness. Kayerts and Carlier, characters in An Outpost of Progress, are fearful, weak, and cowardly – afraid of the jungle but inept at dealing with it, they turn on each other. All these stories take place in an earlier time when such cultural ethos meant something more than civil service or allegiance to the King. While many expatriates bridled at the imposition of a morality that seemed far removed from India or Africa, most understood that it was an element of rule and sanity. If one believed in the purpose of rule, then one should abide by its authority. In fact the colonial era was a time of British greatness. The British Empire with its solidly Western, Christian, and English values covered much of the world. There was much to be proud of and much to be sacrificed in its name. It was an age of exploration and courage in the name of Empire. Adventurers from Mungo Park to Burton risked their lives to map the world and to stake it out for England. Such Victorian certainty seems quaint today not so much because colonialism has been discredited and ethnic identity and national sovereignty revalued; but because the whole idea of ethos has become outmoded. International capitalism, as responsible as it has been for the remarkable economic progress of hundreds of millions of people, has been an equalizer, threatening the idea of cultural integrity. Economic progress and liberal democracy – procedural not cultural signifiers – assure that stubborn cultural values do not get in the way. The free flow of goods and services requires parity and level ground. Yet ethos is not dead. Traditional Hinduism, its highly disciplined and organized social system, and sophisticated religious realism remains in place Chinese Confucianism still assures the internal stability and mutual respect that foster collaborative enterprise; but the West has given up on any pretense of a priori foundational values. Russia, in its attempt to revive the values of its own Empire and the principles of empire itself is turning from the West and to the East. Muslim fundamentalism while still only a relatively small proportion of Islam, still expresses the idea of ethos. Territorialism, expansionism, and hegemony are both political issues and religious ones. Western multiculturalism is a far cry from Empire and serves to erode the universal moral principles of Europe rather than refresh its cultural values. There can be no universal values or principles in a nation of ethnic and racial enclaves. Multiculturalism – the abandonment of cultural ethos – is at its worst in America. Europe, despite the revolutionary changes in national configuration and open borders, still remembers a much more stable and recognizable cultural past. France was not only a beacon of intellectual liberalism but la fille aînée de l'Eglise. Roland and Charlemagne saved Europe from the Saracen hordes. The victory was not just one of armies but of civilization. France protected, defended, and preserved the Christian cultural, religion, and moral values of Europe. America has no such historical brakes. We have always been a frontier, individualist, entrepreneurial, capitalist country. While religion and the philosophy of the Enlightenment provided the foundation for our nation, these inter-related and essential organizing principles have weakened over time. We have become entirely procedural. No great civilization has been without ethos – core cultural, philosophical, and moral principles to which everyone subscribes. While every lasting society has had its dissidents and its revolutions, its cultural values have remained in place. The French Revolution did away with the monarchy and the court but the aristocracy showed itself to be resilient and defiant. The Revolution changed only the political order not the historical class divisions common throughout Europe. More importantly, the Revolution did not affect France’s fundamental culture – a respect for a canon of art, literature, beauty, and ideas. Only now has the canon been displaced. The Russian Revolution had the same profound political and social changes; but after 70 years the culture of the Tsars, Orthodoxy, and Russian civilization has begun to return. Where does this leave America, a nation with military and economic might but unsure how to use it. There is no real purpose for America’s might – no desire for Empire or a civilizing mission but only a desultory wish to promote ‘democracy’ in the name of economic stability and partnership. Democracy alone means nothing. Popular representation and expression must have a purpose. In the mind of our Founding Fathers, there was such a purpose. Only in a free, democratic society was one able to fulfill one’s spiritual promise. The Enlightenment after all was rational but in the name of discovering God. Economic and social well-being would necessarily follow grace and good works. Jefferson understood that individual and community were two necessary and inextricable parts of the same whole; and only if everyone subscribed to the same universal principles could the country prosper. He had no idea how modern capitalism would erode this core ethos. The days of – or even thoughts of – a new American empire are long gone. We have transferred our religious and philosophical principles to one idea – progress. Progress has such an inherent value that everything is done in its name without reflection, disaggregation, or consideration of consequences. Socialism – an idealistic concept of universal progress – failed completely because of its indifference and antagonism to individual enterprise and spirituality. Capitalism – an equally idealistic notion of equality based on market forces – ignores the cultural havoc it has wrought. A truly equal socio-economic society without ethos – cultural or spiritual values which transcend or supersede procedural ones – is no society at all. Such political momentum has gained tremendous inertia; and it is unlikely that even the most grandiose schemes of the Russian autocracy or the Islamic jihad can possibly reverse it. The authoritarianism required to re-establish centrality is a thing of the past. No more British kings, European emperors, popes, Russian tsars, or Chinese mandarins. Only wars – even more inevitable in an unstable world – and reconstruction after them will sort things out. In other words, it was perhaps better to have a clash of civilizations than a conflict between secular, indifferent, socio-political regimes. At least in former days there was such a thing as civilization to promote, defend, and expand.